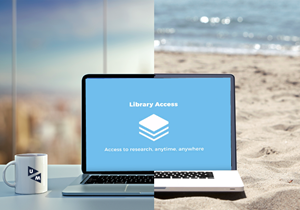 The Library Access browser extension makes it simple to access academic articles, journals and databases licensed by Maastricht University Library. Add the extension to your browser and you will experience the internet as if you were on campus, wherever you are. You are at home and search for scholarly information in any number of different places online (Google, Google Scholar, Bing, PubMed, ResearchGate…). Finally, when you want to access the full text you meet a paywall – even when Maastricht University Library can give you access to the PDF – or get frustrated with the steps you have to take to open the article and actually read it. No more! Install our browser extension and say goodbye to looking for login buttons on publisher websites or switching to the library website to search again. After downloading, the extension will notify you when you’re on a website that Maastricht University Library has a subscription for. Then, it’s just a single click to open the site through the library’s systems and get access to all licensed material on that site. Install the browser extension once and enjoy a simpler, faster way to get access. The browser extension shows an icon in the bookmarks bar. It works almost like a traffic light. If the icon is green, then you have access. A grey icon means that access is denied. If the material you’d like to use doesn’t seem accessible, Library Access will automatically check for open access versions of the article. Enjoy quick and simple access to all licensed and open access resources! We currently have a test license for the Library Access browser extension. Your experience with this tool is very welcome for evaluation matters! For your valued feedback, please follow this link to our feedback form. Find out more about the Library Access browser extension on our service page for this tool. Subscribe to the Library Update or one or more Library newsletters. Our updates cover UM Library services, support, apps and tools, best practices, training, issues, technology and trends with a focus on library-related support and services. Follow this link to the Library Wall and subscribe on the right side of the page.